It seems rain DOES make a difference when deciding an election. As matter of fact it might have cost Al Gore the White House in 2000. 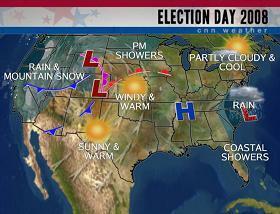 Election Day weather across the U.S. looks mostly dry - a good sign for Democrats? According to Florida State University researcher Brad Gomez (along with Thomas G. Hansford and George A. Krause), just an inch of rain can make a big difference in a tight race. (Gomes, who recently joined the faculty at FSU, did his research while at the University of Georgia). The researchers studied the past 14 presidential elections using simulated weather conditions for those dates based on data from more than 22,000 weather reporting stations. They found that while 1 inch of rain drops overall voter turnout by less than 1 percent, the Democratic turnout drops by 2.5 percent. There was significant rain in the Florida panhandle during the controversial 2000 election when George W. Bush beat Gore by just hundreds of votes in Florida to win the presidency. If it hadn’t rained, enough additional Democrats might have voted in Florida to give Gore the White House. So where might weather play a role during Tuesday's voting? The weather map looks pretty simple: The battleground state of North Carolina, where both the presidential race and a U.S. Senate race are competitive, will see some rain along the coast. The rest of the eastern half of the country should be dry. Areas west of the continental divide will see some valley rain and mountain snow. Does that mostly dry forecast bode well for Barack Obama and the Democrats this time? We'll soon find out. Lobbyists, and corporate donations, pull the puppet's strings. How about the "unexplained" particle the Tevatron folks found? Now that's exciting science, even if we don't know what it is. I toast my great Creator that all men (women included here) are born with free will to their destiny! God is good! I think the Science community should be overjoyed with Presidental elect Senator Obama....the winds of righteousness was at the backs of man and have propelled this Nation, USA, and the world forward. It's my deepest belief you will have support in exploring our space horizens, developing new technologies along the way to help our fellow man. A big Thank You to all those Scientists that bravely sent their letter out in support. A hopeful day for new technology to havert enerty to enable us to be self sufficent, as well as helping our fellow man throughout the world! This is a great day in the life of earth! "are born with free will to their destiny!" Obama puppet, free to push on his corporate strings ? the weather these days is hotter than the previous decades, i guess it is the effect of global warming,*. the weather will always be cold now because the winter months are coming'~"
The very core of your writing while appearing agreeable at first, did not sit very well with me after some time. Somewhere within the sentences you were able to make me a believer but just for a short while. I still have a problem with your jumps in logic and one would do nicely to help fill in all those breaks. When you actually can accomplish that, I could certainly be fascinated. Hi, i think that i saw you visited my web site thus i came to ¡°return the favor¡±.I am trying to find things to improve my web site!I suppose its ok to use some of your ideas!! How will a President Obama impact science, tech and the environment?